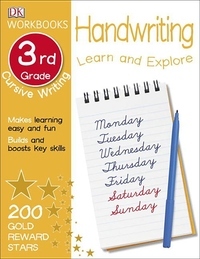 DK Workbooks: Handwriting: Cursive, Third Grade helps kids learn to write in clear, easy-to-read script. From practicing lower and uppercase letters to copying a poem and writing a book review, this workbook is full of activities, exercises, and supportive illustrations that helps makes writing cursive easy for kids to learn. Designed to support the Common Core State Standards, this series is developed with leading educational experts to build confidence and understanding. Each leveled workbook, for children ages three through nine, is packed with activities and challenges, offering the beneficial repetition and cumulative learning that lead to mastery. Fact boxes on each page give a simple overview of the topics being covered, helping children get their bearings, review the basics, and often see an example of the task at hand.